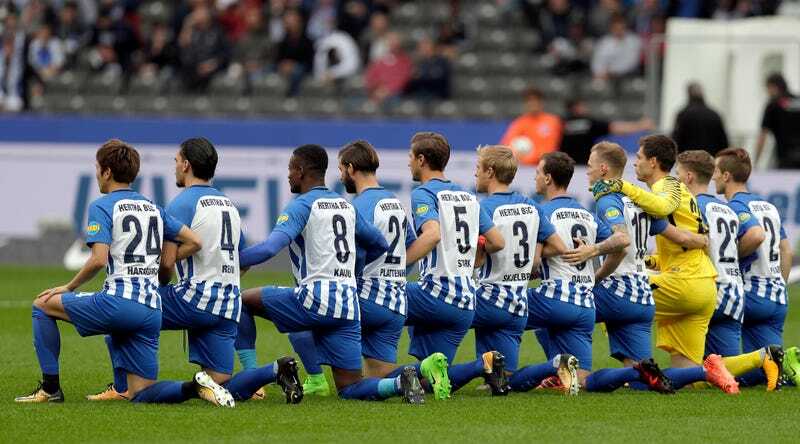 On Saturday the German soccer club Hertha Berlin took a knee in solidarity with Colin Kaepernick and other U.S. athletes who have used the gesture to protest racial injustice. According to the New York Times, the Bundesliga club’s entire starting lineup took a knee on the pitch prior to their match. Off the field, the entire coaching staff, club officials and the rest of the club’s players knelt, too. While the gesture was a clear nod to the former quarterback and the NFL, Hertha Berlin did what many NFL teams did not do in the midst of their public demonstrations of solidarity: They made explicit that taking a knee was about the fight for racial equality. Hertha Berlin’s captain, Per Skjelbred, told the media that the team wanted to “make a stand against racism.” Defender Sebastian Langkamp went even further in his remarks to Sky TV during halftime, according to the Times. There you have it. More German soccer players have taken a knee than Major League Baseball and National Hockey League players combined. Great work, America.